1. 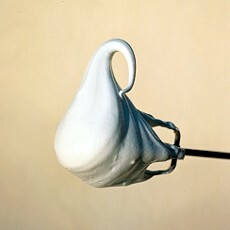 This must be the most popular egg-white recipe of all, whipped with fine sugar into tall, stiff, shining peaks, then very lightly baked so that the surface is crisp and the centre is soft and chewy. 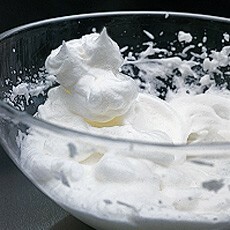 The tricky bit is whisking the egg whites, but the way the meringues are cooked is important, too. 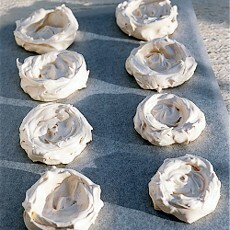 The oven should be pre-heated to gas mark 2, 300°F (150°C) but do make sure you are not going to be using it for anything else, since the meringues stay in the oven until it is completely cold, so that they partly bake and then slowly dry out. 2. The eggs must be spanking fresh as this makes them easier to separate. 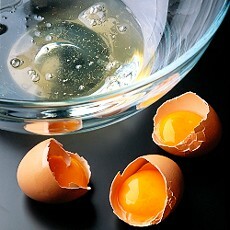 Separate 3 large eggs, one at a time, placing each white in a cup or small bowl before adding it to the whisking bowl. This means that if an accident occurs with, say, the third egg and you break the yolk, the other two are safe. 3. 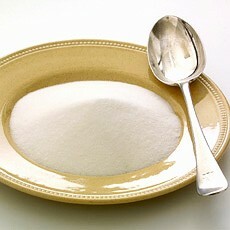 The proportion of sugar is always 2 oz (50 g) for each egg white. So, for 3 whites weigh out 6 oz (175 g) caster sugar onto a plate and have ready a clean, grease-free tablespoon. 4. 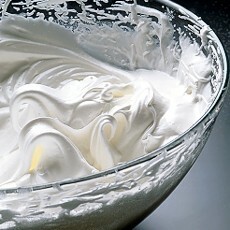 Switch the whisk on to a slow speed and begin whisking for about two minutes, or until everything has become bubbly (this timing will be right for 2 to 3 egg whites; you'll need slightly more time for 4, 5 or 6). 5. After that, switch to a medium speed for a further minute, then whisk at the highest speed and continue whisking through the soft peak stage until stiff peaks are formed. The whites should be all cloudy and foamy at this stage. 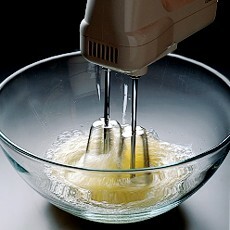 Another test is to look at the whites on the end of the whisk – they should form a stiff peak without falling off the whisk. It's very important not to over-whisk the whites – this will stretch the surface of the bubbles that have formed and they will burst and collapse into liquid. 6. Next, whisk the sugar in on fast speed, about a tablespoon at a time, until you have a stiff and glossy mixture with a satin sheen. Spoon onto baking sheets lined with silicone paper (baking parchment) ready for baking. 7. My own method of baking has stood the test of time and, provided your oven temperature is correct, it will never let you down. You will find the exact temperatures and timings in each individual recipe. These differ according to the size of the meringues and the degree of colour called for, but the general principle is – they go into the oven at gas mark 2, 300°F (150°C), the temperature is then immediately reduced to gas mark 1, 275°F (140°C) for the actual baking and, once baked, the oven is turned off and the meringues are left in there, undisturbed, until the oven is completely cold.